Actually, this project wasn't lazy at all—quite the opposite, in fact. Created by Ohio State University students Carter Hurd and David Frank during HackOHI/O 2016, this robot can (almost) make a mean cup of joe, and it even answers questions using Amazon's Alexa intelligent personal assistant. It also has amazing goggly eyes. What more could you want in the morning? Sadly, Hurd and Frank weren't actually able to engineer the machine to brew coffee through an Alexa voice command—you still need to flip a switch—and its ground-flinging aim could use a bit of work. HackOHI/O is an OSU program by OHI/O started in 2013 that encourages students to think outside the box and get involved in creative tech culture. The hackathon is a 24-hour event in which students create real projects that are presented to an audience of fellow students, professors, and industry professionals. According to a Facebook post, 2016's hackathon included 775 students from schools across the country, 30 sponsors, and over 100 finished products. 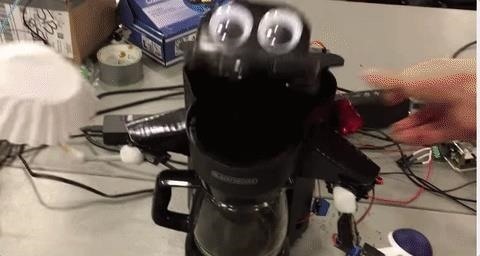 Hurd and Frank brought home the title of "Best Hardware Hack" for their coffee-making robot. The prize for this category was a Raspberry Pi 3 Ultimate Starter kit. As we've seen before on WonderHowTo, Raspberry Pi is able to create some pretty impressive gadgets, so I'm sure the team was pretty pumped with their winnings. There's nothing better than starting your day with a fresh pot of coffee, but knowing that it was made by a robot that can be controlled with your voice does sweeten the deal just a tad. Share this article using the links below, and let us know what you think in the comments! If you enjoyed this post and have ideas about things happening in the world that inspire wonderment, make sure to send a tip to @katie_pooch on Twitter or kpuccio@wonderhowto.com. WTFoto of the Day: A Delicious Glass of What? !